Since humans have existed on this wonderful blue and green planet, smudging and the burning of incense has been used as a way to cleanse and purify the energy of spaces. While its practice has been most associated with that of indigenous people, religious and secret societies, and hippie or new-age subcultures, its use and its benefit belongs to all people, the way water and oxygen do, and can be used a way to provide greater comfort and ease within living spaces and shared environments. Smudging is neither voodoo, nor magic. It requires no belief system or breaks from known cultural tradition. The decision to smudge, burn incense or not is a practical one, really. It’s simply a matter of how free and clear of negative energies do you wish the spaces you spend time in to be. 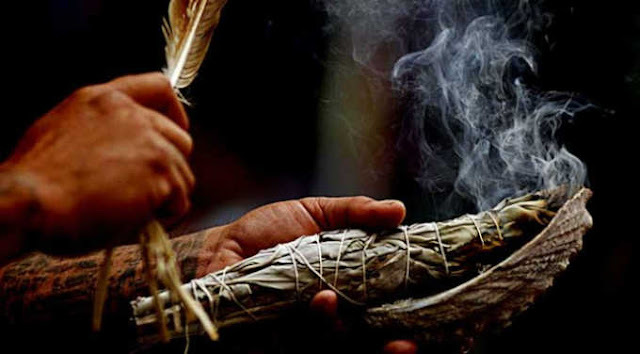 Smudging is the burning of sacred herbs, with sage being the most commonly used. The smoke produced from its burning, or the burning of incense is what naturally cleanses and purifies an area of negative energies. When it comes to smudging or burning incense, it’s all about the smoke, not the flame. Smoke cleanses in the same manner as water, by dispersion and elimination. Negative energies are pervasive in our civilized society and are found in most living areas, work environments and shared spaces. Negative energies, unlike what is portrayed in the movies, generally consists of self-judgments, judgments of others, fears for the future, regrets from the past, hidden resentments and emotional suppression. Most people, whether they are aware of it or not are prone to these thoughts and activities. And even if you feel that you’re not prone, you can unknowingly become affected and influenced, once you have walked into, and spent time in a space where another person has. This is because we are all affected and influenced by the quality of energy we encounter on a daily basis, and while we like to imagine we are in control of our state of mind and emotions, energies experienced within a shared space, can and will influence you. When smudging or lighting incense having proper ventilation is key. The amount of smoke generated must be in balance with the flow of oxygen. If coughing starts by you or anyone else in the room, stop generating smoke and seek ways to improve the ventilation of the space before beginning again. To know if you have had a success smudge look for a small but significant change, which is simply, does the space feel better? Does it feel easier to be in and notice if it has affected your mood in any way. Some people notice that their creativity increases in a newly smudged space or that burning incense while studying or working improves retention and ease to learning, while still other might express simply feeling better. Smudging when done on a regular basis will make each place you spend time in an easier space to inhabit. Smudging you will help minimize negative thinking and slow down the stream of personal judgments that flow through the mind. This can make being, producing through work or play, and relaxing easier. For these reasons the frequency with which you smudge a space or burn incense, will be as important as deciding to start doing so in the first place. To be effective and receive the most benefit, make cleaning the energy around you as top of mind as brushing teeth, cleaning the bathroom, making the bed, washing dishes and the mental reminder to go to the car wash or drop off the dry-cleaning. Choosing an herb that you find pleasing to the senses helps to make the smudge and/or incense experience more enjoyable. Taking a moment to notice how you, and the space feels before the smudge, and comparing it to how it feels after the smudge will further encourage frequency of use.